Building on the success of Canon EXPO 2010, the event in 2015 was a unique opportunity to showcase the company’s present and future vision, expertise and business strategies. Working with Bright Partnership, Dataflow Events was asked to build a customised registration platform to cope with the unique requirements of managing over 19,000 attendees over a 3 day event. Over 40 different reports on travel, transfers, accommodation, sessions, meetings, allocations, dietary and RFID badge related details. 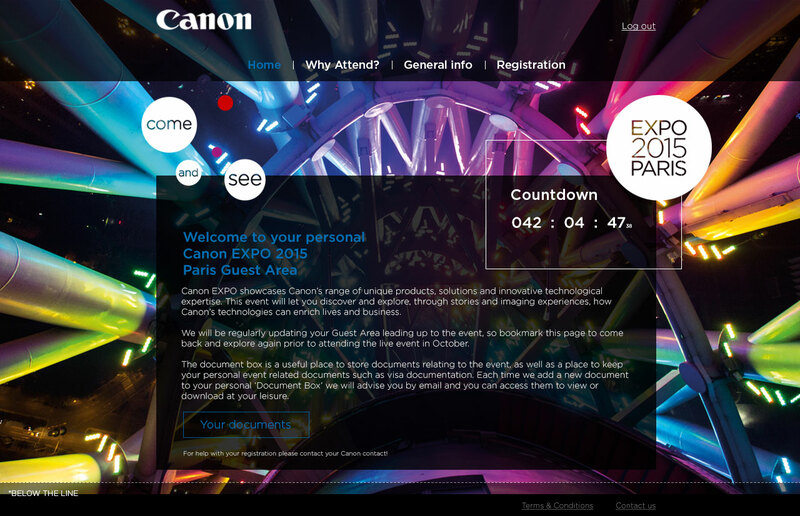 The site was fully branded to create excitement about the Expo with clear Canon branding and an event countdown clock. The clear issue when dealing with such a large number of delegates is the co-ordination of the guests. This process had to be broken into markets, where the markets were allocated assets such as flights and hotel rooms and were then empowered to manage their own registration processes. Canon Expo was seen as a huge success. The technological advancements were reflected not just in the Expo, but in the running of the event and the seamless linking of data from initial registration to the delivery of the RFID badges to the interactive process of these badges on the show floor gathering further personal details.